Recently I joined a group on Facebook for a breeder that my parents have used. She created a facebook group so that the families can connect and share their photos of their golden children. It’s been fun to see the various goldens, and I especially enjoy connecting with people who have siblings of my parents pup, Spenser. Spenser will be nine in September but he will forever be my puppy. My family decided to get Spenser when I was still living at home and we are very close, even though I haven’t lived at home for several years. Every time we come home, Spenser is my shadow. He could never ever leave my mom or dad or his golden brother Oliver but we have a special bond. Tucker and his Uncle Spenser. Everything he needed to learn, he learned from Spenser. Several facebook posts in this group lately have featured new puppies who have gone to their fur-ever homes. It’s so sweet to see these little fuzzies and I even get a bit of puppy fever. 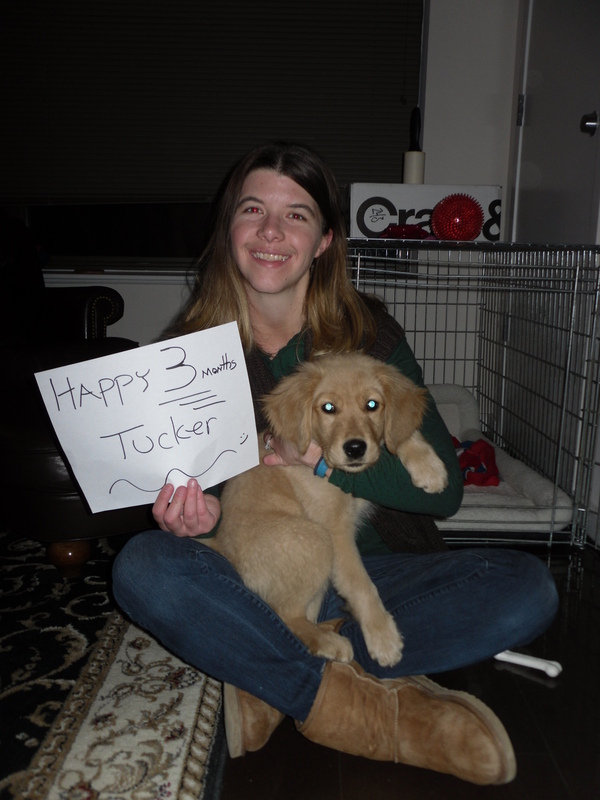 Tucker will be 2 in October so he’s still very much a puppy but you know what I mean, those little guys and girls you can pick up and snuggle….and then I remember the puppy teeth, the wake up calls in the middle of the night, and did I mention those puppy teeth? 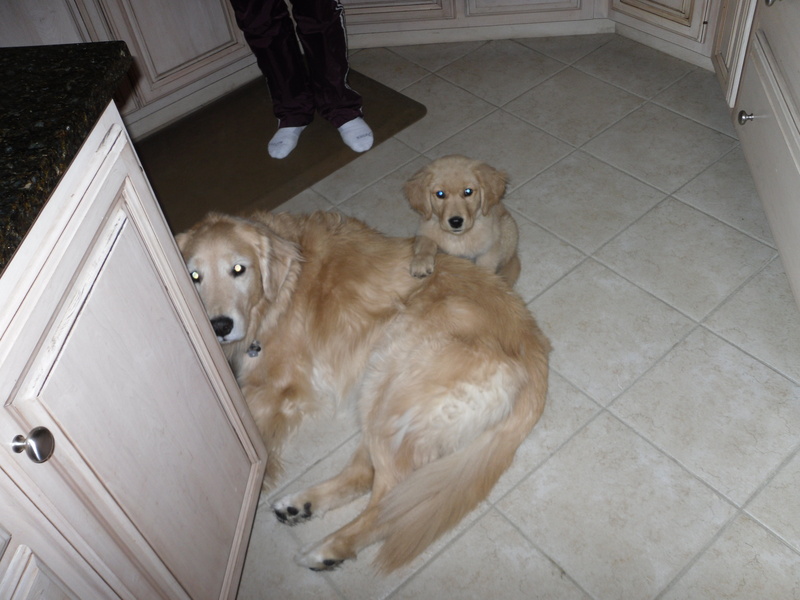 I remember when Tucker was really small and I would look at him and say, what is your personality going to be like? 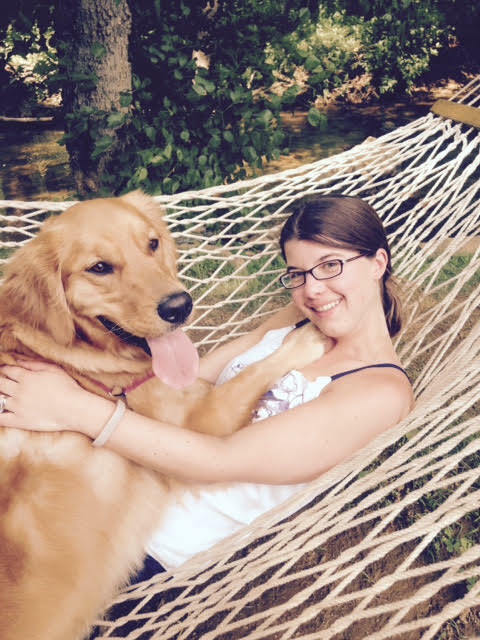 Yes, let’s not forget the title of this blog: Crazy Dog Mom. And don’t forget one of the best parts of puppyhood: you can drink! Can’t do that when you’re pregnant! 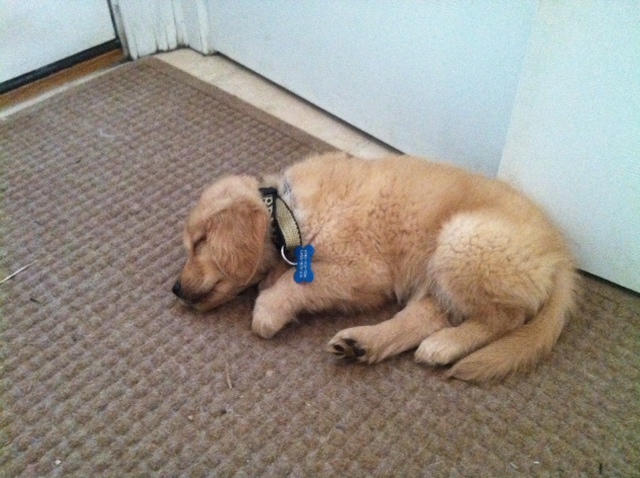 I can tell you exactly his personality now: he’s a sweetie (what golden isn’t though?) with a mischievous streak and he’s a real smartie. He loves being outside and walking through the neighborhoods. He’s playful with other dogs but only a few at a time or else he gets nervous. He loves routines…as do I…he’s still very much a puppy- we’re still working on the jumping and the occasional nip but thankfully there’s no more puppy teeth. He makes friends fast and remembers them for life. 1) Crate Train. I can’t emphasize this enough. We still have Tucker’s crate up and open because he still enjoys going in it even though he now sleeps with us and has a gated off area (which includes the crate) when we are out. I often find him laying in there when we get home. It’s their safe place…and a safe place for you too. I can’t begin to explain how much more peacefully I slept at night during those first few puppy months knowing he was in the crate. The crate is in our bedroom so he never felt alone. 2) Socialize. Another one I can’t emphasize enough. We got Tucker in the winter of the polar vortex in Northern VA. We were fortunate to have places that host puppy socials (welcome to Northern VA, full of DINKS- Dual Income No Kids). We also got him in obedience class as soon as we could. Luckily we live in an apartment complex and a dog friendly community so there was no shortage of friends for Tucker to meet. And don’t stop doing it. 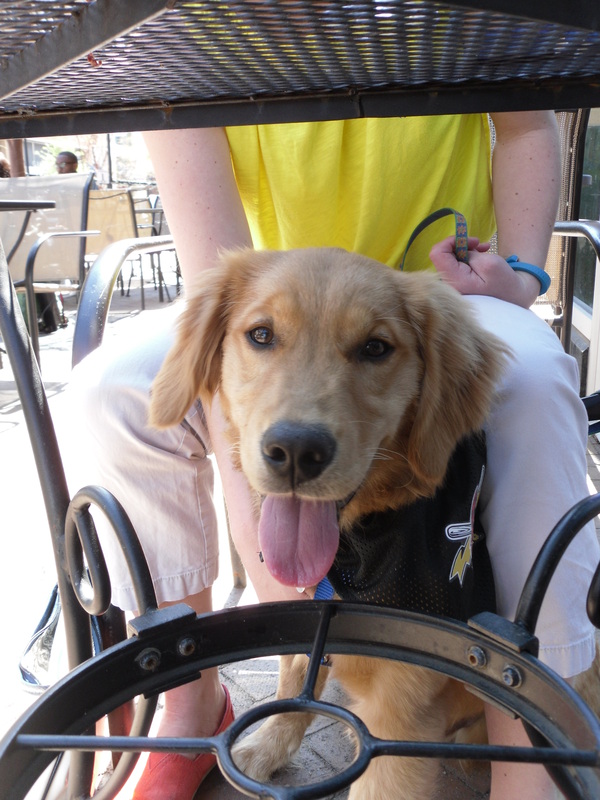 We still take Tucker to dog parks, dog friendly restaurants/wineries/shops, etc. 3) Exercise. You need exercise, your dog needs exercise. If it’s hot or cold, treat puzzles or ipad games (yes, seriously!) My motto in life is that a tired dog is a good dog. Why do you think I’m writing this blog right now? Because I exercised my pup and he’s enjoying a nice little nap right now. If you really want to track your dog’s exercise and sleep, get a Whistle Activity Monitor! 4) Photos. Take Lots of Them. We have 80 million and no, I do not think that’s an exaggeration. 5) Get to know where the best deals are. I love Chewy. My neighbors do too because I see lots of boxes from Chewy in the mailroom. There can never be enough Bitter Apple Spray when you have a puppy or young dog. Once I think I covered myself in it. We have a cabinet that looks like Chewy, Petco and Wylie Wagg threw up. But pups need toys and treats and bones. Remember those puppy teeth? Now it’s time for me to sign off and enjoy some time on the balcony with Tucker. What’s your best dog advice? Leave us some love! We have the exact same philosophy! I totally agree with everything that you have written here. I have also learned that I have a new title….DINK!